Koforidua, Nov. 9, Graphic --The presidential candidate of the National Democratic Congress (NDC), Professor J.E.A. Mills has condemned the alleged moves by certain persons to destabilise the country and distanced his party from any such act.He promised that if ever there were any persons within his party who intended to be involved in such an unlawful act, they would not have their way. Prof. Mills who was speaking to party supporters at the Koforidua Prisons Park noted that the NDC was not so hungry for power that it had to organise illegal means and indicated that the party would not condone any such act. He said the party was sure of victory in the December elections but noted that in the unlikely event of the NDC losing the elections, the party was noble enough to accept defeat, as it had done before. Prof. Mills blamed the Kufuor administration for intentionally being quite over allegations of corruption levelled against its ministers in recent times. 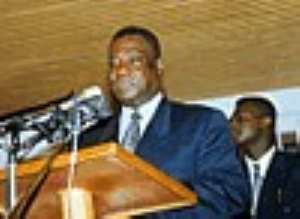 According to him, the Kufuor administration did not admit its administrative mistakes, citing the CFC loan issue as an example.The National Organiser of the party, Mr Samuel Ofosu Ampofo, commented on the high vehicle licensing and insurance fees which he said was adversely affecting the operations of commercial drivers. He said apart from the high prices of goods and services in the various sectors of the economy, there were instances where the salaries of some public officials such as parliamentarians had delayed and gave the assurance that the country under the NDC would not suffer such an inconvenience. He alleged that the National Reconciliation Commission (NRC) was a political exercise aimed at “apprehending the so called perpetrators” and added that under Prof. Mills the country would experience a total “non-political” reconciliation.A former Minister of Employment and Social Welfare, Dr D. S. Boateng,who spoke of the NDC presidential candidate as a patient, honest and hardworking man, urged Ghanaians to vote for him.